Intel keen on Android convertibles for the future according to rumours! There's been a rumour circling today, which started on Digitimes, which suggests that Intel has been telling their partners to produce Android convertible notebooks! PhoneArena suggested that this is to spite Microsoft for their decision to create Windows RT, an OS designed specifically to run on ARM based processors, but we would suggest it is far simpler than that. We've all seen the stories about how companies are struggling to shift notebooks, desktops and other computers at the moment as consumers are picking up tablets, which are cheaper and offer much of the functionality. So what Intel is offering here is an alternative where consumers get Android on their notebook instead of Windows, which gives consumers tonnes of apps and great battery life to boot! 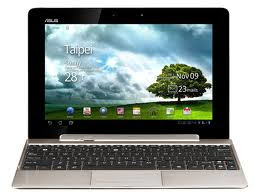 The sort of device which Digitimes is on about here is the Asus Transformer series, which lets you use keyboard and tablet in one. If Digitimes has this correct then Lenovo are set to show off a device with this set up in May, which is only next month! Then the rumour runs that HP, Toshiba, Acer and ASUS will follow up later in the year! The one thing which seems a little bit out on this rumour is the price. At the moment these devices are expected to come in somewhere in the $500 range, which seems totally extortionate to us. The only enhancement you get with the device over something like the iPad for example is a physical keyboard, but this might hit the nail on the head for the average consumer. The pillar stone of this story though is that Intel are meant to be the ones driving this latest craze. If that's right then they are actively pushing people away from Microsoft and towards something new. It's never good news for any company when a key partner starts looking elsewhere and with Google I/O just around the corner, we can probably expect Google to bulk up their tablet offering in terms of devices and software and so Intel might know something we don't! What do you think? Can you imagine ditching Windows for Android completely in the future or do you think Windows will continue to have a place in the computing world? Let us know in the comments below!